There are no examples to be found in crystal structures! 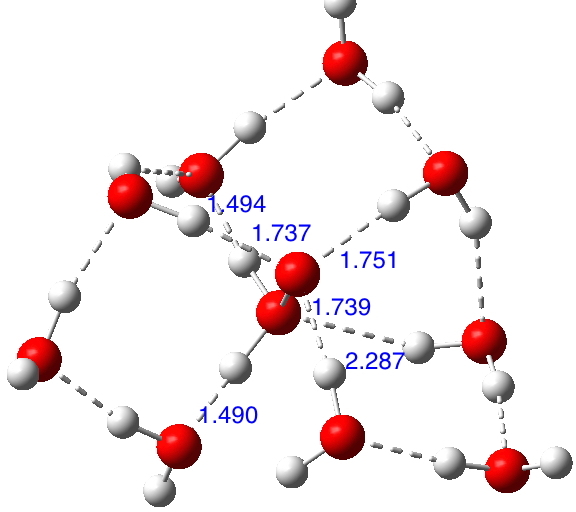 The solvated structure of H2O+-O– is modified directly from that of H3N+-O– and the computed (ωB97XD/6-311++G(d,p)/SCRF=water) structure is shown below. Noteworthy is that the hydrogen bonds at the O+ end are far stronger than those to at the O– end. The corresponding hydrated hydrogen peroxide is 16.3 kcal/mol lower in free energy; this compares favourably with the value for water itself and suggests that oxane oxide might also be capable of isolation inside a suitable hydrogen bond stabilising cavity. This entry was posted on Friday, April 15th, 2016 at 4:12 pm and is filed under General, Interesting chemistry. You can follow any responses to this entry through the RSS 2.0 feed. You can leave a response, or trackback from your own site.